Facing Tuesday’s general strike in Catalonia, CNT wants to show its satisfaction with the response which thousands of workers have given throughout the day and across trades. Popular mobilization responds again against the severe repression which Catalan society is living. Worker’s solidarity shows once again that it can do anything. This isn’t just another call to action. We stand before an attack on rights and freedoms which deepens the breach between the ruling class and us, the working class. State and Capital show their teeth and they do it with a clear goal: shoring up their corrupt and totalitarian system. A system which today we know can be made to stagger thanks to the great combative mobilization. 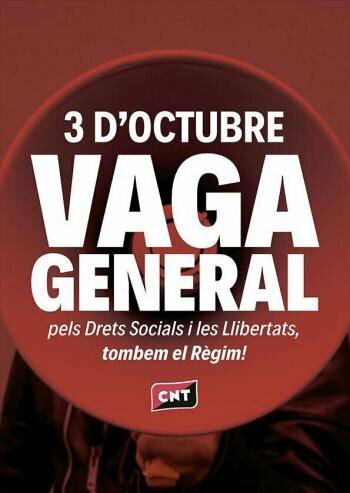 This Tuesday’s general strike in Catalonia is a giant’s step towards the social struggle to demolish this political and economic system. It’s a transcending conflict for anarcho-syndicalism: we don’t fight to switch up flags but for a Social Change in capital letters which allows us to recover the reigns of our lives and everything they’re taking away from us. From CNT we show our absolute rejection towards the bureaucratic apparatuses which call themselves unions and, once again, align themselves with the government and employers in order to torpedo the general strike in Catalonia. This is nothing new. It reaffirms us in our organizational model based on direct action and mutual aid. While CCOO and UGT sabotage the worker’s movement, thousands of people will take part in the numerous calls to solidarity beyond any borders. For them is our recognition. For them is our fight in workplaces and in the streets. For them is the CNT. Against all States. For freedom. For social revolution!